Something very exciting happened last week. Ed was offered a full time position at the school he’s been doing his teacher training at. This means that hopefully, before long, we will be in a position where we will be able to sell his flat and buy our own family home. You may have read previous posts where I talked about making plans for when we move and, when Posterlounge offered to send over some prints from their website, I knew it would be the perfect chance to start planning some wall art for our new home. Currently living in rented accommodation, we are so limited on what we can display on our walls. Rather than fixating on what we can’t do now, I decided to focus on what I want for our own house. Exploring the Posterlounge site I was blown away by how many options there were. There are so many prints available, I spent a good hour just browsing the site and thinking about what I wanted for our new home. If you are struggling a little to make a choice, they have a section offering inspiration based on room types and styles. Prints are also broken down into categories such as animals, landscapes, nature, food and celebrities, making it easier to browse. A feature I really liked was the wish list, allowing you to save images you like to go back to later. I added around 30 prints to mine, and then had a hard time cutting the list down – I will definitely be ordering more once we’ve moved. If you are looking for anything specific, you can use the search bar at the top of the page. I did this as I was looking for something specific (Makeup), and loved the images that the site came up with. Once you’ve made your selection, you can choose which size and finish you’d like. As well as posters, the site offers an array of different finishes for your prints from traditional canvas to beautiful acrylic glass and even Alu-Dibond, a sturdy material with a matte finish. For my motivational prints, which I plan to display above my desk when we move, I went for the Forex material, which gives a semi-matte finish and is incredibly light in weight. I wanted a display which was girly, whilst still being inspiring, and I’m so happy with my prints – Happy, Just Start, Make it Happen, Still Life with Roses and She Turned her Cant’s into Cans! The quality is fantastic, even in photos they look brilliant, and I am so excited to get them displayed in our new home. As well as my motivational selection of prints, I also ordered two posters which I plan to put up in our bedroom when we move. Ed loves Queen, and when I asked him to choose a print from the site he fell in love with this one of Freddie Mercury. I had already chosen the print of a woman applying her makeup, and I think they go really well together as a kind of his and her display. I plan to have them framed, to make them stand out, but again, the quality of the print is amazing. At the customisation stage, you can pick and choose which mounting you would like. For posters, you can choose powerstrips and for other materials there are options including spacers and metal mounts, providing you with flexibility on how you choose to display your prints. For canvases, you can choose to add on a floating frame in a variety of shades. You can even opt to edit your image, changing the colour to black & white or sepia, or flipping the image horizontally or vertically. I love that you can really personalise your print and make it work for you, it definitely sets the site apart from others. My final choice of print was this beautiful shot of Durdle Door, which is local to us here in Dorset. I went for a poster, although I think it would also look stunning on a canvas, and the quality is incredible. I am going to have the print framed, and displayed in our living area, along with the canvas we have of Ed and I on our wedding day in Santorini. I love where we live, it’s such a beautiful area of the country and I am looking forward to including this shot in our new home. Posterlounge are based in Germany, but have an English language based site as well as having recently expanded into France and Spain, with plans to launch in Italy soon. As well as offering prints from well known artists, they also enable more contemporary artists to sell their artwork through the site. Family run, with production kept in-house, Posterlounge offer high quality standards whilst being able to offer flexibility in their design. This is a collaborative post with Posterlounge, however all opinions and photos of products are my own. Such a lovely selection of prints!!! What a lovely way to refresh your home. The quality of their stuff looks amazing, I love that they offer more than just a standard poster too. 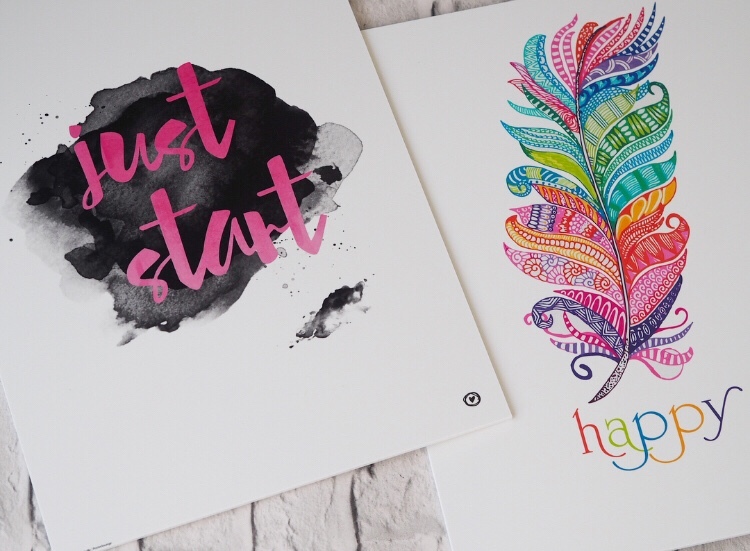 I love prints for around the home,these look like a fab range. These are all so beautiful! We are in the process of doing up our house and I really need to start adding some personality to the rooms so will be sure to check this website out!